Now that spring is finally underway and summer isn’t too far behind, it’s time to start thinking about how you want to decorate and personalize your outdoor space. If you happen to have a commercial or residential rooftop garden, then this is the perfect time of year to use it as a blank canvas and bring all of the creative landscaping ideas you’ve been harbouring during the cold winter months to life. 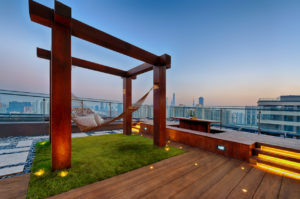 Whether your rooftop garden design is still in the conceptual phase or even if you’ve already started the construction on it, here are a few outstanding landscape design ideas that can enhance your outdoor space and make it more aesthetically pleasing and relaxing. Keep the setup of the rooftop garden simple yet inviting enough so that your employees and clients actually feel compelled to use it. Set up stylish and comfortable patio furniture so that visitors have a place to sit down, relax, read a book, or enjoy a beverage of their choice as they take in the beautiful view. Add fun, bright pops of colour by adorning the furniture with decorative pillows and a variety of plants and flowers throughout the space. There’s nothing more soothing than sitting near a source of fresh running water, whether it’s a natural or makeshift stream, pond, or waterfall. Even adding a well-lit water fountain can establish the desired effect and add a sense of refreshing serenity to your temporary refuge. A portable office coffee and snack bar complete with a vendor is an excellent addition to any outdoor space, especially in the warm weather when people will be very inclined to crave cold caffeinated drinks to beat the heat. Imagine yourself sitting on a lovely terrace, indulging in a cold cup of java and take in the breathtaking view of the bustling city below. Much like commercial properties, residential buildings can also greatly reap the rewards of constructing beautiful rooftop gardens and terraces. Tenants can enjoy the stunning views of the city skylines from the comfort of their own homes, not to mention the fact that they’ll also have access to a variety of amenities at their disposal. Living in an urban setting doesn’t necessarily mean you can’t have access to fresh homegrown fruits and vegetables; it just means you have to get creative. Cultivating and harvesting your own fresh veggie garden with a few of your neighbours can instill a great sense of pride and community. It’s also a great way to get to know some of your neighbours if you happen to live in a condo. Vertical gardens are all the rage right now and they’re the ideal choice for people who are just beginning to hone their interest in gardening because they’re super easy to maintain. Start off with a few simple potted plants, including flowers, herbs, and vegetables and see where your miniature garden goes from there. All you need is a little barbed wire or wooden pallets and you can easily set up a makeshift wall to hang your pots. If you want to get even more creative, you can decorate or make the pots yourself. Always practice a great deal of caution when accompanying your kids or someone else’s kids to a rooftop terrace and make sure you keep a close eye on them at all times. Building a mini play area for the kids complete with a small jungle gym and swing set is a great way to help keep them entertained and make them feel more compelled to spend time outside while also allowing you time to get some gardening done. You can also use that time to teach them about gardening and different plant varietals. Some of the ritzier residential properties in Toronto and the GTA come equipped with a full communal or private hot tub. These are excellent for promoting relaxation all year-round and the whole family can use them. If you live in a condo, it’ll usually be included in your biweekly or monthly maintenance fees. However, if you have your own residential property, you don’t have to worry about any of that and can enjoy it any time you want without the risk of it already being occupied by someone else. Since indoor smoking was outlawed in Ontario a few years ago, it’s now mandatory that most residential and commercial properties allow for specific designated smoking areas for anyone who uses those spaces. Hence, a rooftop garden provides the perfect location for people to indulge in their habit without burdening non-smokers. Outdoor ashtrays are usually provided so that people can dispose of their cigarette butts appropriately. FOREVER GREEN LAWN & LANDSCAPE INC. is one of the top landscape construction, design, and maintenance companies throughout Toronto and the GTA. Over the past 20+ years we’ve managed to establish a strong reputation within the local gardening community and have created beautiful outdoor spaces for thousands of customers across Ontario. All of our landscapers are fully trained across all fields when it comes to gardening and landscape management. Contact us today to book a complimentary consultation or to receive expert advice on how to maintain and beautify your rooftop oasis!